The 534000-003 ribbon is compatible with the Datacard SD260 & SD360. Save time and money with our custom premium bundles. Designed to include all your ID card printing essentials – a colour ribbon, plain white PVC cards, badge holders and lanyards in your choice of 10 colours! Our premium lanyards are made from 10mm flat, tubular, polyester and come with a health and safety breakaway and a metal clip. Simply choose the colour for your lanyards, click buy and we'll get your bundle shipped out to you. If you require a bundle which isn't listed, please contact us on our chat and we will be happy to help. 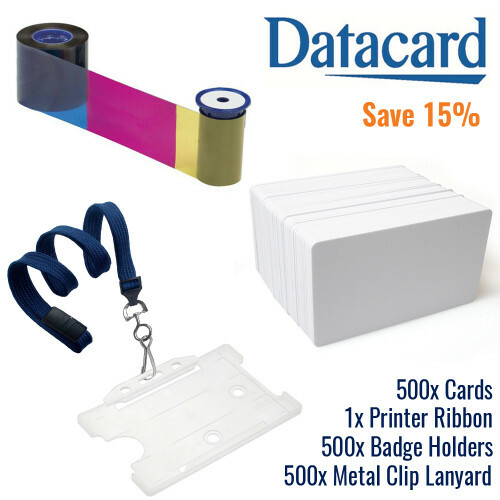 FOTODEK PVC Cards Plain White 760 micron CR80 Number of cards per pack: 100 cards Card S..
10mm Plain Lanyard with Metal Dog Clip Pack Size: 25 lanyards ID Card Centre Part Number: 06-1..
Datacard YMCKT Colour Printer Ribbon Prints per ribbon: 500 Manufacturer part number:&nbs..
Datacard Consumables Economy Bundle This Datacard Economy Bundle includes: YMCKT Colour&nbs..
Datacard YMCKT Colour Printer Ribbon Prints per ribbon: 250 Manufacturer part number:&nbs..
FOTODEK PVC Cards Plain White Gold Foil Edge 760 micron CR80 Number of cards per pack: 100 ca..
FOTODEK PVC Cards Plain White Spectrum Hologram Foil Edge 760 micron CR80 Number of cards per pack:..
FOTODEK PVC Cards Plain White Security HoloImage 760 micron CR80 Number of cards per pack: &..